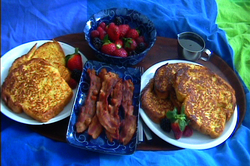 I simply have to start working days with a high protein breakfast -- usually an on-the-run sandwich of some kind. Often it's eggs. But sometimes I tire of scrambled, omelet, over-easy...and that's when I turn to egg salad. Yes, egg salad for breakfast. Or sometimes for lunch. It's delicious, fast and makes a sort of cool refreshing change from a hot egg sandwich -- and it feels almost spring-like at this time of year. So here's my entry for End of the Month Egg on Toast Extravaganza #4 -- the brainchild of witty bloggers Jeanne at Cook Sister! and Anthony at Spiceblog. The other day (shortly after the crack of dawn when we educatrix-types have to get up) I realized that I had both some lovely dilled egg salad in the fridge and a beautiful loaf of prosciutto bread from Morrone's. I threw together this little creation, snapped a sadly lacking photo, wrapped it up, grabbed the coffee thermos and ran to work. 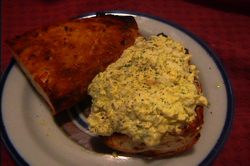 You can't really see the quantities of finely snipped dill with which the egg salad is laced, although the camera seems to have caught the generous covering of freshly ground pepper. The sweet little morsels of prosciutto that are snuggled into the toasted hunk of bread are also not apparent. But they were there. And they were good. Egg salad is really a matter of taste. It's great with chopped scallions or finely minced red onion, but when I'm making it as breakfast option, I don't always put those in. Ditto mustard -- if it's for later in the day, I like a little spoonful of good Dijon in there. I actually like it with everything at almost any time -- I'm just conscious of trying not to offend my workmates too early in the day. I save that for when we're all more alert, and can enjoy it better. I also skip celery in this, although I love it, because I find that it makes the egg salad too watery and my sandwich gets soggy. Chop the eggs finely -- a pastry blender is a great quick tool for this. Mix everything else in, and taste. Does it need more lemon or salt? Should it be creamier, pepperier, dillier? Adjust to your liking, and chill. 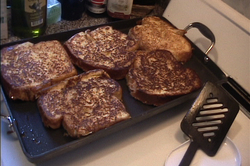 Make some delicious sandwiches on your favorite bread -- pumpernickel and toasted whole-grain also work really well here. Eat in a leisurely fashion, or wrap and run. I love the griddle that was among my holiday surprises from Santa (aka G). 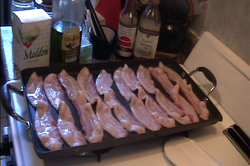 I can cook up a whole bunch of bacon, which in our house is a good thing, since we like it for grilled sandwiches and things other than breakfast..